Listening Room: Toni Redd is back and Redder than ever! A few years ago we introduced SoulTrackers to singer extraordinaire Toni Redd. Her expressive alto voice reminds some of the great Phyllis Hyman, but Toni has her own musical vision -- one that classic soul and jazz lovers will love. She’s made a career sharing the stage with many of the biggest stars of our time, and has become known as a “singer’s singer,” someone who other stars look to as a great vocalist. 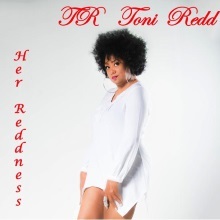 We’ve been digging Toni’s music for a few years now, and so we’re extremely excited that she has a brand new album coming November 6th called Her Reddness. On it she practically defines adult soul music, bringing a bunch of melodic tunes with great guest musicians like Kirk Whalum and her beautiful voice front and center. So we’re pleased to be presenting Her Reddness as our new SoulTracks Listening Room, giving SoulTrackers the chance to catch up with one of our favorite singers. Check out the album below and then find it for a special price at Amazon.com. Enjoy!